Discussion in 'Obsessions and Interests' started by Weezer, Apr 15, 2019. Any electronics or computer special interest members here? I dabble in electronic repairs, kit builds and experiments. There is so many inexpensive components and kits available out of China at the present it makes my head spin. This can be built in an hour or so. I got several of these 10A 230V capable timer relay circuits I want to incorporate in my aquarium lighting circuits. I went to school for electronics and computer engineering technology. Have automated many waste water treatment systems, built too many desktops to count and repaired both desk and laptops. Repaired appliances, etc. Don't do much of it anymore. I did electronics as my primary career in military but did not adopt it as an interest for some reason. I did like getting into the complexity of it all at times, like troubleshooting down to individual data bits. Very challenging but satisfying when you succeeded in locating and repairing the problem. 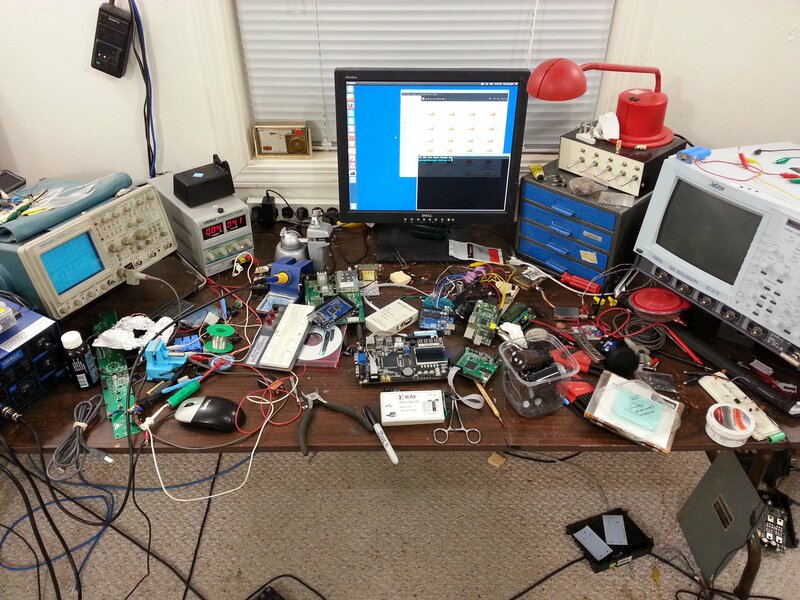 Here one of my electronics labs that I have at home. Kinda messy though. I saw a video online where a group of electrical engineering students from Australia go on a tour of the big electronics flea markets in Shenzhen, China. They show cavernous exhibit halls with small booths (maybe 5 meters long) side by side, and each one of those booths represents a component factory. One girl said she got lost and had to ask for directions. That's how big they are. I love fixing old radios, homebrewing electronics stuff. Not very many kits out there anymore. I can put together computer hardware in a basic way, and have built computers. Also not too bad with software. Have been taking apart simple appliances and putting them back together since I was a child. Like fixing things. Other than working with car and house wiring and wiring guitars, I have done a few things. Built a mpg computer for several cars (found instructions online but customized it to my liking). Built a pellet stove controller with a thermostat, relays, and 555 timers. Fixed a headlights-on alarm with a transistor. Rebuilt my welder circuit board a couple times. Recently fixed the tachometer in my car, but followed an online writeup. There are tons of other things I would like to do, and I'm getting better, but electronics is something that I have a very difficult time understanding. Especially when it comes to capacitors and things. I can already design and build mechanical things. If I could master the electrical end of it, I could make just about anything. Computers... I was pretty good in the days of DOS and Windows 3.1. Since then, computer technology has passed me by and they irritate me. I just use them as a tool. I am a college electronics instructor; the more I learn the more I find I don't know, it is a huge field. For solid state Malvino's "Electronic Principles"
These are all text books that start out at a pretty elementary level and assume you know nothing. But I would definitely start out with the AC/DC book. Without knowing the basic principles of current flow, resistance, capacitance and inductance Malvino might be hard to understand. People have a lot more confidence than knowledge. @FreeDiver Love your setup, looks like a lot of fun! @Nitro I know, it is so freaking cool! You wanna talk about misconceptions out there in the field of EE. I can tell you about one that just drives me crazy. Do you know the real reason why AC current won over DC current in the battle of the currents? If you ask any university professor (Including ones from MIT.) or any person that has a degree in EE. They will always tell you this "Ac current travel more efficiently over long distances because of the propagation effect. Much the same way how waves travel in a pond when you drop a rock in." which to me is udder BS. The real reason why AC won the battle of the currents is because it made possible the use of a device called a "Transformer". If you don't know what a transformer is. A transformer is to electricity what a gearbox or transmission is to mechanical, It's use to step-up and step-down voltages and amperages. Transformers allow voltages to be stepped-up really high so amperages can be lowered allowing for electricity to be carried longer distances with minimal losses. Transformers are also used to lower the voltages and increase amperages to make it safe to use in your house. AC current won the current war because you can't pass DC current through a transformer and the power grid needs transformers, not because for some propagation effect. I liked working in the field,* too, but the components became too small for me. Even though I wasn't offended by the smell of solder fumes, they kept giving me sinus infections (and visible lung problems). I have since recovered from them. My programmer training included programmable controllers, a specialty among electricians. I wish that I could have done more with those. @FreeDiver , I think that AC was adopted for the stated reason (relatively low currents). In that system, transformers became both necessary and advantageous, another reason to support AC's use. I have over $10k invested in automotive scan tools and digital sampling oscilloscopes I used to sort out driveability, transmission and anti-lock braking systems issues on microprocessor controlled vehicles. The shop enabled me to make the cash to dump back into my racing habits and a place to work on my own rides. At one stage of that game, I had 4 employees including my office girl. It was a pretty good cash cow and I actually enjoyed the challenges it presented. My first scan tool was considered the best available at the time, the very popular Snapon MT2500 "brick" I bought in the early 90s. It has live data streaming on top of the code reader ability. Ford's EEC IV ECUs did not allow for live data streaming until way late into the game, so they were always very difficult to diagnose, more often then not requiring an o'scope to get a proper look at glitches that wouldn't hard flag a code. The brick was about $2500 new and required yearly updates to keep it current. It only covered fuel control systems. When OBDII was put in effect, I moved forward to an OTC Genisys setup that had a piggybacked multimeter/4 trace digital sampling oscilloscope as an option because the brick didn't handle the task as well on OBDII systems. OBDI required manufacturer specific cabling and connectors, so the US gov't stepped in for a mandate of one universal tool with a universal connector in a specific location instead of anywhere the engineers felt it should be. My brick has so many cables and connectors with it, they no longer all fit into the blow molded case designed for the tool. The manufacturers walked right past the original mandate by providing what they were forced to, then requiring the purchase of "personality" keys to unlock their specific functions on a pay for play basis. It returned to the same old same old once again. My OTC Genisys was an expensive investment at the time, but quickly paid for itself by placing a one hour minimum charge for it's use. Even though the OTC scan tools manufacturer functions are long outdated,I still have all of that stuff and believe the OTC tool is current to about 2002 for manufacturer specific functions. The generic side of the OBDII scanners will function perfectly well on basic troubleshooting to this day as the protocol it uses was government mandated in 1996. I own about 4 scopes worth about $35K and If you're a tax payer. Then you probability helped paid about 98% of that bill. That LeCroy scope in the right of my picture, I got that in 2005 and had an MSRP of $18k. But I got it from a government auction for only $250. Except for the sample memory, that scope is loaded with all the hardware and software add-on you can get for it. If you got to ask? Yes, I do live in a government ran town. That's how I get access to these things. There are legitimate reasons for locking down some of the functions in the ODB interface. If you don't know what you're doing, you could cause damage to the engine by tweeking the wrong parameters. Plus, you can also reprogram new keys with this and this is sometime a weakness that can be exploited by car thieves. I've hack the CAN BUS on modern cars and have discovered that I can control the engine throttle through the CAN BUS. Luckily, the butterfly valve in the throttle body is still mechanically linked to the accelerator petal which prevents the ECM computer from having %100 control of the engine. I can change a light bulb....LOL. That said I've often said if not for my Autism I'd be an electrician.